Stearns and Foster have been around in the mattress business for a very long time now, almost since mid-1800s. They are known as a premier luxury mattress brand and are widely reputed as a high-quality mattress company. Stearns & Foster mostly deals in mid- to luxury-level mattresses. Their mattresses use individually wrapped coils for support and contain gel memory foam, regular gel foam, cotton, latex, cashmere, wool, and silk in the comfort layer of mattress or cover. One striking feature of Stearns and Foster mattresses is that they look great. Many mattresses are overly plain and really need to be spruced up with fancy bedding to make them look presentable in a bedroom. Stearns and Foster are different in this regard. The mattresses are designed to have a great look and luxury appearance. Stearns & Foster products have luxury materials and padding. Most of their collections offer customers a choice of either latex foam or memory foam padding and a pillow top or SmoothTop Construction. Stearns and Foster take their fabrics very seriously and do not skimp on quality. Their mattresses have a “Cashmere infused” covering. The covering is a fabric blend of cashmere that offers a cool, smooth, luxurious and absorbent sleeping surface. Stearns and Foster provide their customers with a vast variety of models so that you can find one that best fits your specific requirements. Their mattresses vary in price, construction and comfort level. The price range is usually from $1,200 to $4,000. The comfort levels available at Stearns and Foster are plush, cushion firm, firm and ultra firm. It may take a bit of research to decide which comfort level suits you best. They also provide variance in mattress build, with conventional innerspring models and models that are hybrids or memory foam and innerspring. The Lux Estate Hybrid collection with Queen sets starting at $2399. This collection has Prima Cool Elite Gel memory foam, and cashmere and silk infused cover. The Estate innerspring collection comes with IntelliCoil Encased cover and has a starting price of about $1699. The Lux Estate innerspring collection starts at about $2199 for a Queen-size bed with Latex specialty foam and silk and cashmere-infused cover. Signature Collection mattresses have Queen sets starting at $1499, with silk infused cover. These names and prices may vary in retail stores. Prices may vary according to additional features such as gel memory foam, pillow top style or latex foam padding. Stearns and Foster gives customers a lot of choices with its various models. Depending on the model, the price can get quite hefty if you are on a budget. If you are going to make a purchase from Stearns and Foster, you are suggested to get one of the lower-cost pieces. Keeping in view the durability concerns, choosing the lower-cost model is probably the way to go. The biggest complaint from customers is longevity. Many users reported sagging in the mattress after a short period of time. Based on the structure and construction of the mattresses, longevity is an issue. 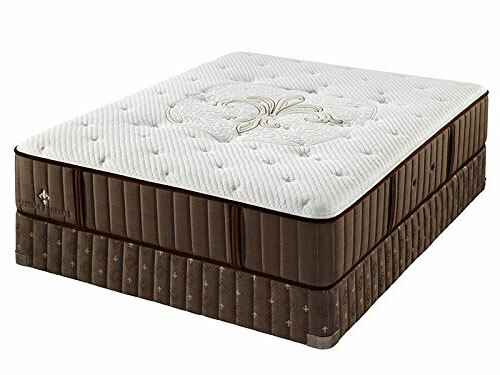 If you are not a skinny or light weight person, you will soon begin to notice depression forming in the center of your Stearns and Foster mattress. If you are looking for a durable mattress and are obese, this mattress is not recommended for you. Stearns and Foster mattresses are thick, indeed. From 12 inches (30.5 cm) to over 20 inches (51 cm) for their most models, this is a hefty and heavy mattress with significant edge encasing and tufted surfaces. It doesn’t matter which Stearns and Foster model you choose, all these mattresses will provide you with a great balance of support and comfort. These mattresses have an individually wrapped titanium coil system, and they may have a varying number of comfort layers and memory foam on top. While purchasing memory foam mattresses, circulation is always an important concern. Memory foam can heat up and cause disturbance and discomfort during sleeping hours, if there isn’t something in the structure of the mattress that prevents this. Stearns and Foster’s mattresses have a proprietary vent system that prevents the mattress from heating up, enables good air circulation and provides a nice and cool sleeping experience. Stearns and Foster’s products are great for couples, worried about motion transfer. The individually wrapped coil system minimizes sleep disruption, caused by motion transfer. This is a unique feature of this mattress, and it is a big plus if you are sharing a bed with a partner. High quality: Stearns & Foster employs high quality materials in manufacturing of its products. No compromise is made on quality. Several retail stores: Customers can visit one of their many retail stores to check mattresses before purchasing. Customer Support: Stearns and Foster provide customer support during the weekdays and competent in-person support at the retail stores. Large variety to choose from: Customers can select from a wide variety of models, including memory foam, innerspring and hybrid mattresses of different features. Warranty: This brand gives a high-level warranty and will replace its product item, if it proves to be defective in any way. Best for eco-friendly consumers: Stearns and Foster mattresses are made from eco-friendly materials. Their mattresses can be quite expensive, especially if you opt for additional features. Their mattresses are not suitable for obese people. A lot of people complain of their mattresses starting to sink soon after their purchase. Longevity and durability of this mattress is not that good, compared to some other luxury brands.